Arena Cleaning Services - North Walsham Guide is created in North Walsham for North Walsham. "Professionally cleaning carpets & upholstery since 1993. The customers choice." Simon and Jackie Demmen welcome you to Arena Cleaning Services. We are a specialist Carpet and Upholstery Cleaning Company established in North Walsham in 1993 to offer professional carpet and upholstery cleaning services to Domestic and Commercial clients covering North Norfolk and the East Coast. Domestic, Commercial and Industrial Enquiries Welcome. We cover Great Yarmouth, North Walsham, Aylsham, Cromer, Sheringham, Holt, Fakenham and Norwich and all surrounding towns and villages. Arena Cleaning Services thank our customers who took the time to post a review on Google, and for allowing us to add the comments below. Jackie and I really appreciate it, thank you. "I would highly recommend Arena Cleaning Services, Simon and Jackie were punctual,organised friendly and thoroughly professional , they new exactly what they were doing and transformed my living room carpet - special mention to their wizardry with unidentifiable stains - Thank you Simon and Jackie for a first class service from first e mail enquiry to final result." Thank you so much for taking the time to write your review, Jackie and I are delighted you are happy with your clean and really appreciate your kind comments. Very pleased with outcome of carpet cleaning, looks really good and all stains gone. Have recommended you to friends so hope you get more work from that. Thankyou once again." "Thank you for forwarding your invoices and, as always, doing such a thorough job"
Thanks for doing a wonderful job, will be in touch regarding Cromer soon. "Can I just say what a truly wonderful job you have done. I am so pleased, it has really made a big difference to how we are now living". Hi Simon, thanks loads for making my suite look like new, and for being accomodating to max lol. "You're welcome Michelle, thanks for the comments. Max was sweet :-)"
End Of tenancy Carpet Cleaning North Walsham Norfolk. Thank you for the tremendous effort with our carpets. They came up a treat and passed!! I have passed your number onto my mum who's looking for a carpet cleaner soon. Thank u. Many thanks for your efforts and quick response. The stain is no longer noticeable. Will use again and recommend. I would just like to say thank you for your recent services for cleaning my Three Piece suite, My wife and I were very very pleased of the job you have done. We were so thankful for the job you have done, so we have passed your name to a couple of friends who may need your services. Thank you Simon. Will contact you later regarding remaining rooms. Please find enclosed cheque in payment for lounge carpet cleaning, we are really pleased how it looks. Thanks very much. The sitting room carpet looks great - I didn't think you would be able to make it look that good! I will speak to you in the New Year about the other carpets. Carpet Cleaning Wood Norton, Norfolk. Thank you for doing these carpets so promptly and efficiently. End Of Tenancy & Carpet Cleaning Baconsthorpe, Norfolk. pleased with everything, it looks fantastic. We would be happy to recommend you to anyone. I hope we will be able to call on you again when the tenants leave. All the carpets look superb I am truely amazed. Thank you very much for the carpet cleaning. It looks very good. State of the art equipment and eco friendly products form the bedrock of our 8 step service. Our solutions are safe for you, your family, pets and your carpets. We will..
1) Inspect. We survey the carpet so our customers know what to expect. 2) Pre Vacuum. It's essential carpets are vaccumed to remove loose soiling. 3) Pre treat stains. Coffee, tea, wine etc. We pre treat difficult stains rather than 'hope' we can remove them as we clean. These are rinsed to stabilise. 4) Pre-spray. 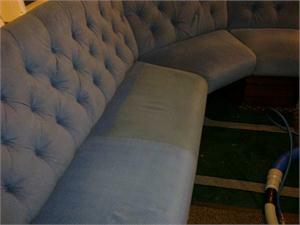 Used to loosen traffic areas and sugar/sticky stains and general soiling. Followed by..
5) Agitation by either machine or rake. This will open matted fibres and allow the pre spray to the fibre, rather than just laying on the surface which is of little use. 6) Rinse extract with either rinse solution or water. In most cases plain water is sufficient but in some circumstances we use a rinse solution. 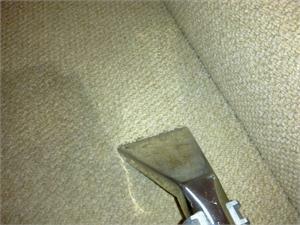 Previous cleaning with a hire machine, carpet shampoo can leave residues causing re-soiling. Our solutions will help to solve this. 7) Re-inspect. A final look over. 8) Groom your carpeting. This resets the pile and allows for quicker drying. Our 8 step service. Available from just £59.50.